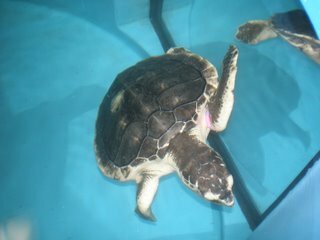 This is an update on Orion, the Kemp's ridley sea turtle with pneumonia. I last reported about Orion in January. I am happy to say that Orion began to feel better after starting nebulizer treatment, injecatble antibiotics and oral antifungal medication. He is now eating well and swimming normally. However, we began to notice that the back end of his right lung looked more abnormal on x-rays. The x-ray indicates that there is abnormal tissue in that part of the lung. We call this "consolidation," and it could mean that there is still an area of infection, or it could just be dense scar tissue that formed after the original infection had resolved. To further investigate this area, Orion had a computerized tomography (CT) scan at Tufts Cummings School of Veterinary Medicine. Based on results of the CT scan, we decided to perform a lung biopsy on March 4 to determine whether there was still infection within the consolidated tissue. We used measurements from the CT scan to determine the precise location for the biopsy. Because the lung is just below the top shell or carapace, we can biopsy the lung by making a small hole through the shell, and inserting instruments into the lung. Orion was put under anesthesia, then had a small hole (5 mm diameter) drilled through the shell. We then penetrated the lung to take a swab to test for bacteria and fungus. There are several small brown nodules in the lung which may be areas of current or past infection. The scope also has ports through which we can introduce instruments to take tissue samples or biopsies. When the surgery was done, we sealed the hole with antibiotic paste, a small bandage, and waterproof epoxy. We will remove the patch in a few weeks to see if it is healing OK. Orion recovered quickly from surgery and was back in his pool swimming happily by the end of the day. The tissue biopsies have been sent to a lab for microscopic analysis (histopathology). This will allow us to see whether there is bacteria, fungus or other abnormal cells. So far the culture tests have not found any evidence of infection. Orion can be seen on display in our Aquarium Medical Center. In fact, the entire surgery was performed on display in the Medical Center. So stop by to visit. You never know what cool stuff you might get to see! Thanks to the staff at Tufts for assisting with Orion's CT scan. Really interesting seeing this procedure from start to finish. I'm glad Orion is doing ok.